Some thoughts about planets outside our own solar system. I was watching a show about extrasolar planets today, and it made me think of some things. First, let’s start by saying that the search for planets outside of our own solar system is terrifically exciting – with planets come the possibility of life, and finding life outside our solar system (or, indeed, anywhere outside Earth itself) would be absolutely fantastic. A lot of attention is given to the possibility of life-friendly planets, but I see very little attention given to the possibility of life-friendly moons. However, it’s worth remembering that moons of such planets might indeed be the right size and temperature for liquid water to form – and thus, be potentially life-bearing. Indeed, given how common larger planets are, and how larger planets almost always have lots and lots of moons, it stands to reason that it might be more likely to find an “Earth-like” moon than an “Earth-like” planet. Of course, at the moment we have no real way to detect moons of extrasolar planets – so for the time being, we’ll continue to focus mostly on finding planets, not moons. 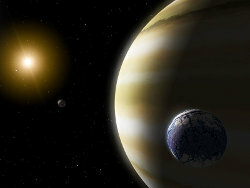 But once we do get the ability to detect moons (perhaps when we build some larger space-based telescope arrays), I think we’ll make some exciting discoveries when we look at existing larger extrasolar planets with an eye towards finding their moons. In any case, the search for planets (and moons) outside of our own solar system that might be suitable for life will continue, and these discoveries will continue to astound and amaze us. I couldn’t help but notice the other night that the full moon was out – and it was really, really bright. So bright, in fact, that I decided I could hand-hold some photos of the moon! In retrospect, I probably still should’ve used a tripod – after all, I was taking these photos at maximum (12x) zoom. Still, the moon was SO bright that I was able to take them with a relatively fast shutter speed. They didn’t come out too bad; although they aren’t very interesting – there was nothing near the moon for a background or foreground or whatever. Still, I’m pleased with the way they came out. This last one is a shot of the moon without any zoom. It’s really amazing how small the moon is – or, to put it another way, how large it seems to our easily-tricked eyes! I spent some time the other day with my telescope and the half-moon, but didn’t get any photos – although the view was spectacular. Once I figure out how to use my camera with the scope, perhaps I’ll have something I can share here. Until then, this is the best I can give! Apparently it’s common to refer to the first time you use your telescope as “first light.” Which I guess makes sense. Anyway, I had “first light” with my Meade ETX-80AT-BB a week or so ago, and I figured I’d share the tale. Now, for my first time using the scope (for real), I decided to stay close to home – just in case. So I did this from my porch – which is more like a small balcony, really. It faces southeast (generally speaking), and due to the fact that there is another porch above me, doesn’t actually have a very good view of much of the sky. BUT – I have a great view of Orion at around 9pm, and I know there’s the Orion Nebula in there, so I decided to try looking at that. It took a few tries for me to get the hang of the “alignment” procedure for the scope – the computer controller is very helpful, but if you don’t start out pointing exactly north (and if you forget to tighten the clutches correctly), it won’t point in the right direction and you’ll end up hunting for stars that aren’t anywhere near what the scope is pointed at. It also helps to know a few of the bright stars in the sky at the time you’re going to use the scope, and to be able to identify them visually without the computer. The scope’s computer really does try to find a star that’s not only bright, but by itself in that area of the sky, which helps a lot. Eventually I got the scope aligned (it took 3 tries before I did it right – and I think my compass was not pointing properly due to perhaps some metal on the porch, or the power lines that are not terribly far away either) and got it point at the Orion Nebula. Which, of course, is exactly what you’d expect from a small telescope! But nevertheless, considering that it was my first try (and really there was nothing else interesting in the sky at the time I was looking) I was not disappointed. Eventually of course I plan to bring together my camera & my telescope… or at least use the two at the same time to do some astronomy and some astrophotography. I shall post my results here, of course! Telescope icon courtesy of the Crystal Icon Set. For my 30th Birthday, I got a Meade ETX-80AT BB (the “backpack observatory” edition) telescope. Needless to say, I was excited. So, I unpacked it from the box and set it up for the first time in my house – to get used to it, and make sure all the parts were there. Turned it on, moved it around… worked great! I couldn’t wait to take it out and try it. The scope wouldn’t fit in the backpack. I called Meade to see if maybe I had gotten the wrong backpack, or if they had heard of people calling in with a similar problem (maybe I was just missing something?). They didn’t have any help – they would just have me ship the scope back to them and wait over a month for them to have new ones in stock before they’d even ship me a replacement. No thanks. So I went back to my local camera store (Madison Photo Plus, in Madison, NJ in case anyone cares – very nice people there, as we’ll see) and asked if maybe we could swap out the bag from another one? I had thought that perhaps I had somehow gotten a back meant for a smaller scope – the ETX-70 or something, perhaps. The people at the store – and this is a proper camera store mind you – wanted to look into it a bit more. They called their Meade sales rep (no help there), and then decided to compare with the floor model. The scope didn’t fit in that bag, either. Perhaps there was a problem with ALL of the scopes they had?? All of us were sitting there scratching our heads. The scope definitely wouldn’t fit in the bag – it needed at least another inch, maybe two. The 3 camera store people and myself were stumped. Eventually they decided they would give me a different hard-case temporarily so I could carry my scope around (as I said, they’re nice people) when, on a whim, one of the guys picked up the display scope off its tripod and brought it over to the counter – it was smaller than my scope! Now, I’m sure there are people reading this who have already figured out the problem, but bear with me here, I’m trying to build drama in this story. I examined them side by side to see what was different. The tube on mine was longer than the tube on the display model. I took the dust covers off both scopes and looked down the tube… and saw a metal rod in the display scope. In my scope, that same rod was there, but it was recessed further in the tube. I showed it to one of the camera store people and a light went off in his head. The metal rod was threaded – it was used to make the tube longer and shorter – THE FOCUS! OF COURSE! When I had been setting up the scope in my house, I had pointed it out the window at my porch and tried to focus on that. Naturally, that was very close to the “near” end of the focus range. Which naturally extended the tube. It was a very head-slapping moment. I turned the focus nob back all the way in the other direction, and sure enough, the tube shortened and fit in the backpack just as it should. Problem solved! All of us admitted that we should’ve known this was the problem, but we were blinded by the mystery of the bag, so we missed the obvious answer. And so, my tip for any new ETX-80 owners out there is… when you put the scope back in its bag, if it doesn’t fit, just turn the focus nob the other way! So simple – like many problems once you know what the cause is. Anyway, I hope that this story helps someone out there… otherwise I’m going to feel really stupid! For those that are keeping track, we’re coming up on my 30th birthday this November – a momentus occasion, apparently. And because of that, it seems as though some fun new toys may be coming my way. I’ll give you a hint: the terms aperture, focal length, and alt-azimuth mount have been thrown around. In case that wasn’t enough of a hint, I’ll just tell you – I’m getting a telescope, as well as some fun new attachments (filters, lens adapters) for my camera. Specifically, the telescope I’m getting is a Meade ETX-80-TC, and for my camera I’m finally getting an adapter to let me mount any standard 58 mm camera attachment. Some of the other things I’ll finally be getting include a polarizing filter and some of those fun ND grad filters I’ve heard so much about. I may even figure out a way to use my camera with the telescope… but we’ll see. I’ve had a wish-list of accessories for my digital camera for quite a while – so I knew what sort of stuff I wanted for that. As for the telescope, that was more recent – born from my recent capture of Jupiter on film, my photos of the lunar eclipse, as well as from a long history of being interested in astronomy from a very young age. I’ve never owned a really “good” telescope – and certainly never one with a proper mount – so I’ve been very limited in what I could see. When I started thinking about a telescope, I really didn’t know much about the topic – and once it was seriously suggested as a gift for my 30th birthday, I found out how little I really did know! Being the geek I am, I just had to learn everything about the topic (how else could I make an informed choice? ), and thus I spent hours and hours on Wikipedia and other sites learning about focal lengths, apertures, telescope designs, eyepieces, the limits of magnification, and so forth. It might sound funny, but it really is a lot of fun to learn about something truly new! So, in short, the next few months should be rather interesting! Stay tuned!